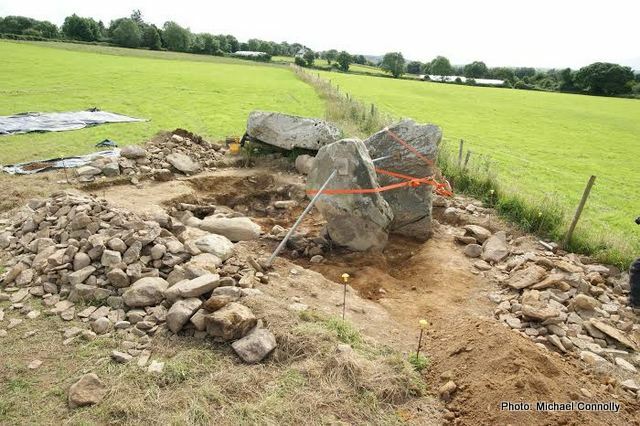 The cremated remains of at least two people have been discovered following an archaeological excavation at a Neolithic tomb in Killaclohane, near Milltown, Co. Kerry. Most likely erected around 3800 BC, this monument represents one of Kerry’s oldest upstanding structures. 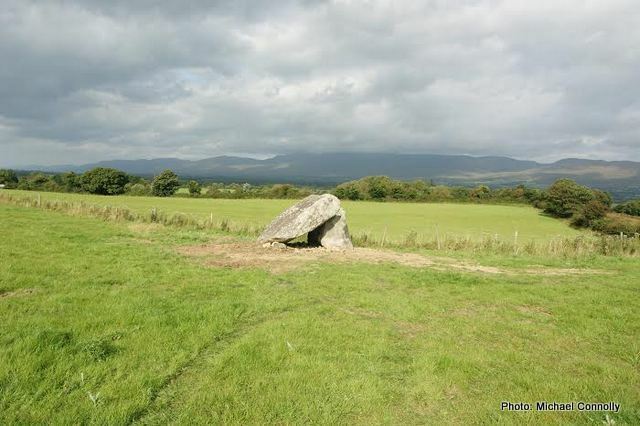 Megalithic monuments such as Killaclohane are classified as a portal tombs by archaeologists, and there are approximately 174 of these structures in the country. The tombs generally consist of two large portal-stones defining the entrance and a back-stone, all of which support the roof-stone. The roof-stone can be of considerable size, with the largest example at Brownshill, Co. Carlow weighing circa 100 tonnes. It is not known how these very large stones were moved and raised but it probably involved a combination of wooden rollers, ropes and man/animal power. It is possible that ramps of earth and stone were used to haul the large roof stones into place and some portal tombs have evidence for denuded cairns (stone mounds), which may have been used for this purpose. At Killaclohane the landowner, Mr Ken O’Neill, noticed that the tomb’s roof-stone was slipping and that the monument was in danger of collapse. To prevent any further damage occurring to the site a team of archaeologists were called in to carry out conservation works. 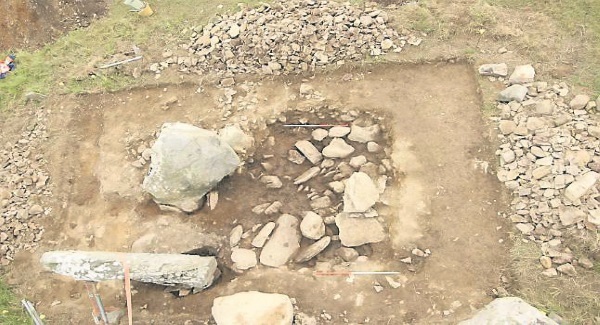 This necessitated a small excavation, which was directed by Kerry Council’s resident archaeologist, Mr Michael Connolly. The cremated remains of at least two individuals were recovered during this work and these appear to represent the remains of an adult and an adolescent. The bones, which were in a quite fragmentary state when found, are currently being analysed by osteologist Linda Lynch. It is hoped that this work will reveal more information about the individuals genders and ages as well as any pathologies that may be present. 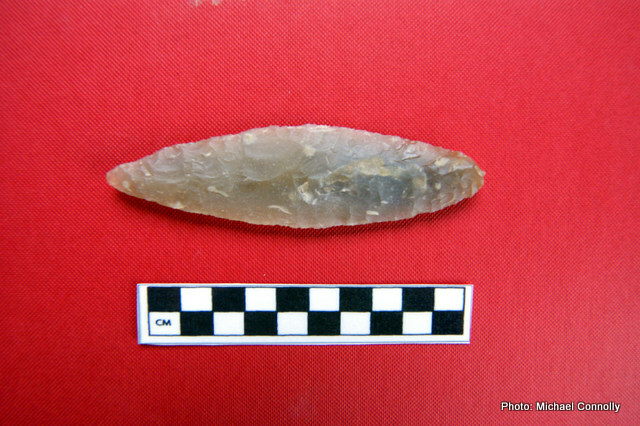 A number of artefacts were also recovered during the excavation, including sherds of Neolithic pottery, flint arrow-heads, flint scrapers and a beautifully made flint javelin-head. 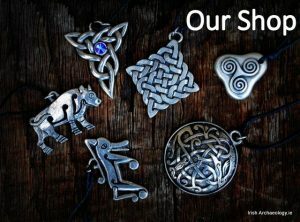 This assemblage is comparable to the finds recovered from the iconic portal tomb at Poulnabrone, Co. Clare, a site which is broadly contemporary to the Killaclohane monument. “Portal tombs are the earliest type of megalithic tombs. 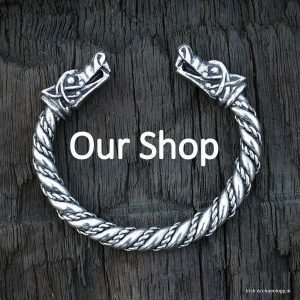 This tells us that very early in the Neolithic period when people were beginning to settle and farm, rather than wander around, they settled in the Milltown area“. Good story-telling, Colm.Happy to read this as I’ve visited this site many years ago and have long wondered at its origins. Many thanks for your research and skillful relating of the story behind this ancient place. That you could relate it to the Poulnabrone Dolmen in time makes it even more interesting. D.
It WAS a pristine site. So, instead of just righting the stones, they dig it up, disturb the dead, and leave the tomb a mess. How would they like it if I went and dug up their cemeteries, to see who their parents were?